The 3-level of government Climate Emergency Declaration petition and campaign targets all levels of government since individual states or territories could declare a climate emergency earlier than the federal government might. (See the local council level of the campaign here.) See state/territory politicians who aleady support a Climate Emergency Declaration here. However, one major role of state/territory governments is setting the legislation and regulations that control the types of projects that are approved within their own jurisdiction. Accordingly, by far the easiest and most obvious component of climate emergency action at the state/territory level is for governments to ban new projects that would make climate change worse. Therefore we are running No More Bad Investments (NMBI) campaigns in various states and territories in parallel with the Climate Emergency Declaration ask. State and Territory governments have the power to ban specific types of projects within their own state, like Victoria did with it’s recent ban on on-shore gas mining, and to encourage safe-climate projects, like ACT’s adoption of ambitious renewable energy targets. For further details of the NMBI campaign and the model NMBI legislation drafted by Environmental Justice Australia, see the pages under the NMBI tab on this website. The first and easiest step in a Climate Emergency response by state/territory governments is to ban NEW climate-damaging projects. 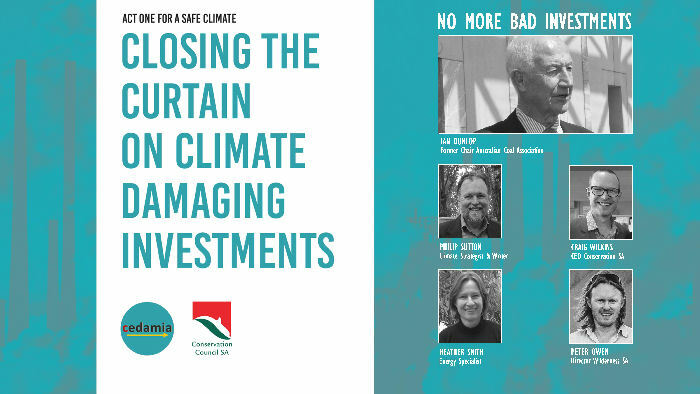 The NMBI public forum discussed model legislation to ban new climate-damaging projects in SA, why that is urgently necessary, and the implications of doing so. 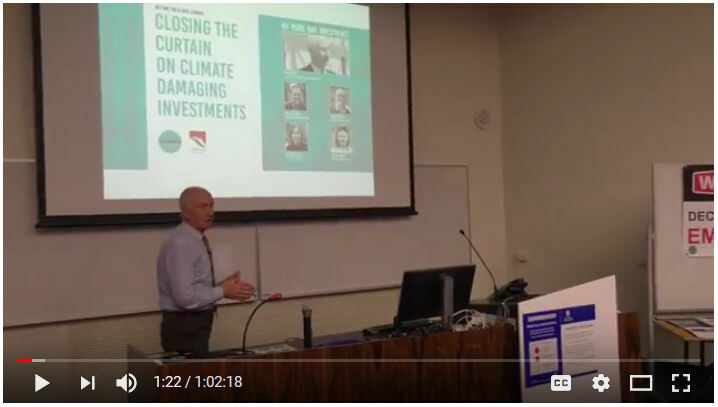 If you missed hearing Ian Dunlop speak at cedamia’s NMBI forum, take a look at the YouTube clip below to hear exactly why we need emergency climate action, and how quickly.